In March 2014, Thailand’s Kasikornbank reached the major social media milestone of 100k twitter followers with the @KBank_Live twitter account. My Visible Banking Team now tracks well over 3,000+ twitter accounts (banking, insurance, investment, cards and payments) globally: over 20 million twitter followers from 88 countries (1st March 2014). 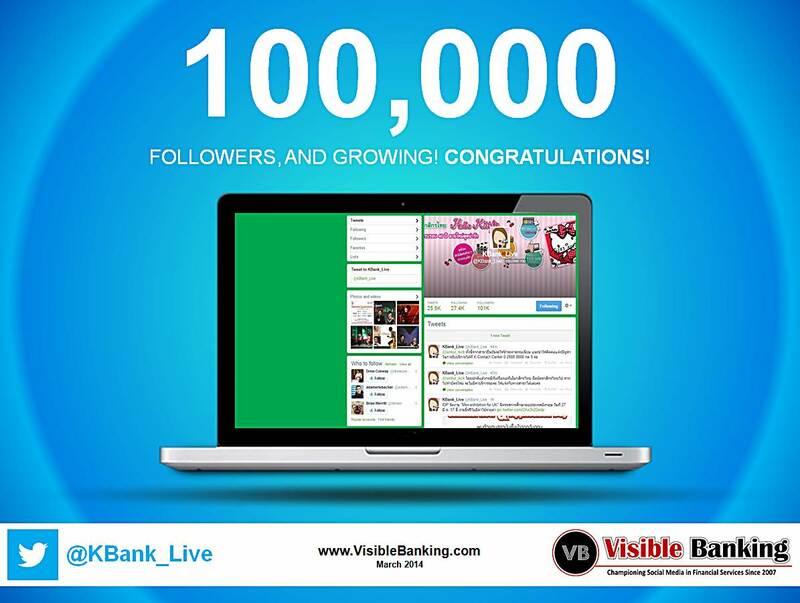 Congratulations to Kasikornbank (@KBank_Live) for recently reaching no less than 100,000 twitter followers! It positions their twitter account in the global top 30 most followed banking accounts. If it is easy to have a twitter presence, and create one or several twitter accounts, it is much more challenging to build trust and establish yourself as an authority and a source worth following on the popular microblogging service. Twitter is saturated with a mix of inactive or spamming accounts (mostly fake, bots or ghosts) and the volume of noise and meaningless conversations has reached an all-time high. Know Your Followers (KYF©): so you have a big twitter follower base? Good for you. Bear in mind that it is easy and cheap to buy tens of thousands of ‘real looking’ twitter followers nowadays. Like with your facebook fans, you must aim to attract the right followers. The valuable ones: influencers, journalists, business partners, employees, prospects, customers. Size is important, but it is not everything. Tweet and engage with your audience on daily basis (SMO): having an account and pushing the occasional press release is not enough. Tweeting once a day a few tweets in a row with a poor syntax (hence virtually no reach) doesn’t work. You must understand the popular social media channels like twitter or facebook, design and implement a smart twitter strategy based on quality content, engagement, response, and call to action. How do you think you compare with your peers in banking or insurance? Do you feel your current twitter presence doesn’t generate enough activity? How much do you know about your ‘communities’ on twitter and facebook? As usual, I invite you to share your comments on kasikornbank’s major 100,000 twitter followers milestone, and also your best practices on twitter and social media in financial services here, on twitter or on google+.